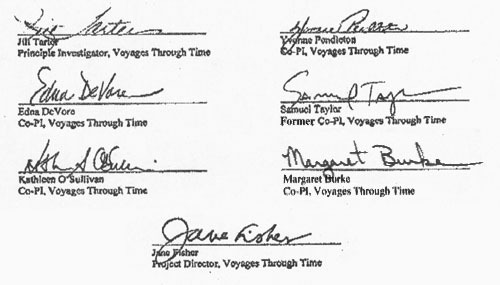 What is Voyages Through Time? Voyages Through Time is a year-long, integrated science curriculum for ninth or tenth grade, based on the theme of evolution and delivered on CD-ROM. In Voyages Through Time (VTT), evolution is defined as cumulative change over time that occurs in all realms of the natural world. The evolutionary scope of Voyages Through Time (VTT) is billions of years long and ranges from the Big Bang to modern technologies. The evolution of everything provides a compelling "story-line" for the entire curriculum. The year-long VTT curriculum is divided into six modules: Cosmic Evolution, Planetary Evolution, Origin of Life, Evolution of Life, Hominid Evolution, and Evolution of Technology. Individual modules can also be used in discipline-based science courses such as biology, earth science, geology, or astronomy. The science content covered in VTT has been developed in conjunction with over forty scientists; they have also extensively reviewed it for accuracy. Teachers and science educators have overseen the pedagogy of VTT for its appropriateness for early high school students and the classroom. Rich background information is provided for teachers who may be unfamiliar with particular science topics. The expertise of practicing scientists is provided in the student reader articles and videos, and the latter help students see scientists as "real people." Lesson groups and activities are teacher-directed and classroom-centered. Teachers use the CD-ROMs to prepare and to present activities, and students participate in a variety of inquiry-based learning experiences, ranging from microscope explorations of live cultures, to density and differentiation experiments, to computer-based database activities. For additional information, please see Using VTT in the Classroom. The curriculum uses the guided inquiry approach known as the "5 E'S" from the Biological Sciences Curriculum Study. Students are actively involved in exploring phenomenon and developing their own understanding of concepts. For additional information on the instructional model, see Instructional Model. At the SETI (search for extraterrestrial intelligence) Institute, we are intrigued by the ancient question "Are we alone in the universe?" and we are actively engaged in doing observational experiments that may some day find the answer. The scientists here pursue research projects that explore the origin, evolution, and distribution of life-as-we-know-it and as we don't-yet-know-it. Our colleagues are not only astronomers, physicists, and engineers, but chemists, biologists, mathematicians and specialists in animal behavior. The breadth of the science we do here is enormous, yet is it all beneficially interrelated and focused on one overarching scientific question. SETI researchers have been comfortable with this multi-modal approach since Frank Drake first formulated the Drake Equation in 1961. This equation forces us to organize our ignorance about subjects ranging from the birth and death of stars to the evolution of intelligence and technology. More and more, other scientists and other research areas are embracing this sort of interdisciplinary approach. Scientific disciplines are merging and morphing, integrating and adapting in amazing ways. Biology has become the basis for some microchips, and the infant field of computational biology is using the formal systems analysis of electrical engineering to understand in detail the functioning of the cell. Students need to be exposed to the concept that a problem, or a question, defines the scope of today's scientific exploration, and that the tools used to answer that question will be identified, learned, borrowed, and modified from any discipline that promises to move our understanding forward. In searching for an overarching theme that would engage young high school students for an entire year, we tried to find one in which they could involve themselves. Helping students understand the scientific explanation of where they came from and what their future might hold seemed to us to be the most compelling theme possible. Using all of time and all of space, the Voyages Through Time curriculum allows students to calibrate their own personal place in the universe, and to stretch their concept of past and future. The spatial scales of this curriculum cover the largest thing there is (the universe) down to the cellular and atomic. Time spans measure change over billions of years and over the 18 month doubling time of digital technology as represented by Moore's Law. There is something here for every student. If some of your students become inspired to wonder about whether students on distant planets circling other stars are also trying to figure out how they fit into the scheme of the universe, then we will have succeeded in helping to train our future colleagues. Just as the big questions in science require an integrated and collaborative effort, so has Voyages Through Time. This curriculum is the result of lots of collaboration among the institutional developers and across disciplines and directorates within each institution. Scientists from the NASA Ames Research Center collaborated on the Cosmic Evolution, Planetary Evolution, and Origin of Life modules. Scientists from the California Academy of Sciences collaborated on the Evolution of Life, Hominid Evolution, and Evolution of Technology modules. Scientists and science educators from San Francisco State University worked with us across all of the modules. Thanks to our location in the San Francisco Bay Area, additional assistance has come from the University of California campuses at Berkeley and Santa Cruz, Stanford University, Santa Clara University, and the United States Geological Survey. And, of course, teachers from California and 27 other states have been instrumental in the development of VTT. All of us working on the development of VTT have enjoyed the cross-disciplinary collaborations required to make this curriculum a reality. We were all enriched by the process and had a great time doing it. We wish the same to you and your students, and hope that you will find this epic story of the evolution of everything as fascinating as it is to us.